The artic exploration schooner "Bowdoin." 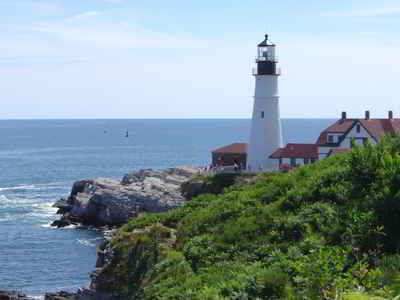 Built during the winter of 1920-21 in East Boothbay, Maine, to Admiral Donald MacMillan's detailed specifications, Bowdoin has made nearly 30 voyages to the often ice-jammed waters of the artic. 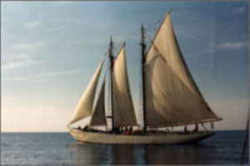 As built, Bowdoin is two-masted auxiliary schooner 88 feet long, with a 20.2-foot beam, and a 9.4-foot depth of hold. The vessel is registered at 66 tons gross and 15 tons net and displaces 210 tons, the Bowdoin is the smallest vessel designed expressly for Arctic work, but also one of the strongest. The vessel is ballasted with 21 tons of iron and concrete for additional stability. 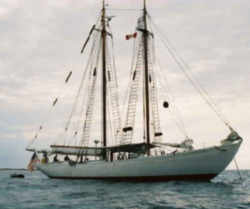 The ship is a two-masted auxiliary schooner, double-planked, and double-framed with white oak. A five-foot belt, one-and-a-half inches thick, made of tough Australian greenheart, protects against ice, and the rudder is overly large for turning easily and quickly when working through narrow stretches of open water between ice packs. The Bowdoin's propeller is deep under water to avoid damage, and the hull is rounded, designed to rise up out of the water when caught between ice pans or to crush ice blocking the way. A nosepiece of steel plate weighing 1800 pounds is bolted to the hull to aid in crushing ice and protect from collisions with heavy ice. In May 1941, the Bowdoin was sold to the Navy for the duration of World War II. Under the command of Lt. Stuart Hotchkiss, the Arctic schooner helped to establish airfields in Greenland and perform hydrographic surveys. 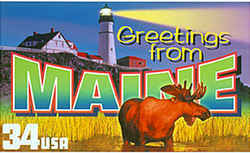 MacMillan bought the Bowdoin back from the Navy in 1945 at the end of the war and continued to sail North for nine more years. Today, after stints as a museum vessel at Mystic Seaport and as a charter ship, the Bowdoin is used at the Maine Maritime Academy in Castine, Maine, for training runs to Labrador and Greenland. Once again, the Bowdoin sails the icy seas of the frozen North. The law designating the schooner "Bowdoin" as the official Maine state vessel is found in then Maine Revised Statutes, Title 1, Chapter 9, Subchapter 1, Section 218. PL 1987, Ch. 703, §1 (NEW).